Anyone who has ever tried to plug in an appliance only to find that it wouldn’t turn on is familiar with how frustrating electrical outlet wiring problems can be. The whole purpose of having outlets is the convenience, but that goes right out the window when they stop working without warning. Although a dead outlet might automatically seem like a big problem, sometimes it can be due to a simple issue. This isn’t always the case, of course — sometimes there will be electrical outlet wiring problems that can only be addressed by a professional, particularly when the issue is with your outlet’s wiring. You might be able to save yourself a call to an electrician if your outlet problem is something easily fixed. You can even resolve some minor issues without the use of tools! If you know what steps to take, you may be able to figure out if the dead outlet is something you can remedy yourself. If you discover the problem is something that should be handled by a professional, don’t take any chances. Messing around with wiring can put you in danger and damage your electrical system instead of making the problem go away. ● Test your lights and other nearby outlets to see if the problem is just one outlet. If nearby lights aren’t working it could mean a blown fuse or tripped circuit is at fault. Check your panel for tripped circuit breakers, and if you find one, resetting it might solve the problem right away. If it doesn’t allow you to reset it without tripping again, you might have a serious issue with your system, and you should call an electrician immediately. ● Look for GFCI outlets — they’re the ones with the “test” and “reset” buttons on them — and try resetting them. These outlets are designed to protect you from shocks by tripping and cutting off the power when there’s an issue. Even if the dead outlet isn’t a GFCI, outlets are often linked, so resetting it might solve the problem. If you try to hit the “reset” button, but it keeps tripping, it could be a sign of a potentially dangerous leak in the electrical current. ● If none of the above methods yield any results, there could be an issue with the outlet’s wiring. Electrical outlet wiring problems can be simple or complicated, but either way, it is important to be careful if you plan to check the connections behind your dead outlet. Shutting off the power is a crucial step, and it is important that you call an electrician instead of doing anything you are not trained to handle. Sometimes a problem might seem like a quick fix, but there could be other issues that might go unnoticed by someone who lacks experience. 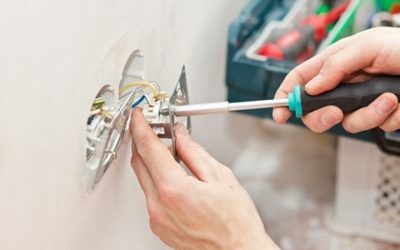 Electrical outlet wiring problems can be the result of loosely connected wires, loose “stab-in” connections, and loose screws. While a powerless outlet is an obvious consequence of problems like these, another result can be an excessive amount of heat produced. This can not only melt wires, but can also cause damage to the outlet itself. You might need to get your outlet replaced if you have loose connections. An electrician will be able to figure out the extent of any damages for you. An electrician can remedy these wiring and connection problems, while also providing you with new outlets if needed. New connections can be made, new wires run, and if the issue is deeper in the heart of your system — at the panel, for instance — an expert can solve it in a way that makes sure you won’t need to worry about it happening again. Get in touch with our team at Bryan Electric, Inc., today at (770) 680-2144 for assistance with your electrical outlet wiring problems. We’re also happy to answer any questions you have.